Enjoy your stay in your Sun Marina Village Club in Saint Jean de Monts or in Saint Hilaire de Riez to discover the Vendée by bike. Between sea and forest, our 5-star campsites are ideally located. In this exceptional setting, cycle along the coastline and discover the most beautiful landscapes of the Vendée coast. Many bike paths will allow you to get around Saint Hilaire de Riez and the surrounding area. Between coastline, countryside, marsh and forest, several flat and landscaped paths are offered. To facilitate your orientation on the different routes, you will find directional signs as well as a tourist signage. Throughout your journey, information terminals will allow you to discover different tourist sites. 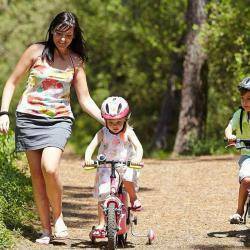 In Saint Jean de Monts, the Circuit des Fontenelles is a nice bike ride for the family. Between the public forest and the beaches, discover the diversity of the landscapes and the scents of Vendée. In total safety, leave with friends, family and children on roads and small roads with low traffic. While discovering the Vendée landscapes, spend a pleasant time with family or friends and enjoy an unforgettable stay in the Vendée. At the reception of the campsite, you will find tourist leaflets with maps of the bike paths. If you’re looking for a holiday accommodation in Saint Hilaire de Riez, you can contact our camping.